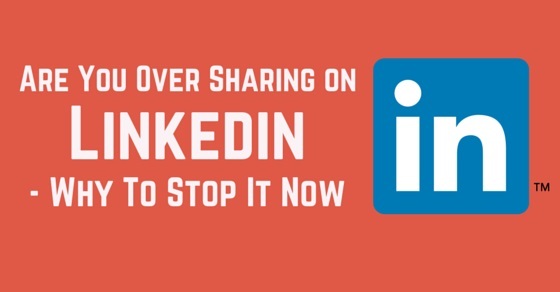 Are you Over Sharing on LinkedIn – Why to Stop it now? LinkedIn is the new way to showcase your professional value. It’s a new social site giving you a chance to just make a professional portfolio for yourself. Started in May 2003 it added to the race of social networking by 2011, when the public started noticing it. Soon it became an important part of profession networking. Now it’s an integral part of one’s portfolio. LinkedIn has provided with a great platform so that professionals, recruiters and employers all around the world share more professionally, ideas and things with each other. An effective LinkedIn profile is to share your content and articles. It’s more sort of publishing hub for the writers now. It has been seen that content over LinkedIn has more views and participants than any job oriented activity. But it’s important that your content is professionally written because it’s a way for you to reach the many professionals and share yourself out. It’s important that you make a great LinkedIn profile for others. You have to make stage ready without any sloping mistake. Your profile needs to be complete with true and valid information. When you’ll be involved in other activities over the site other user might want to know who you are and visit your profile to get answers to their questions. So provide them with a strong profile. Make out professional content in your profile. Let your profile say for you. You need to make it polished and so loud that recruiters are easily attracted towards you. Make sure to be genuine and true. Share content and say your thoughts. Check out more and more content on LinkedIn. Comment on them. Let people know your existence over LinkedIn. It will help you get noticed over the site and more of people would know. The more contacts you make the more it would help you to grow. You should always update LinkedIn profile. Even with the single change it needs to be updated. You joined a new office or left a job. Doing a course or done with course, you need to have it updated. Only updated profile resume would get you more opportunities for you. This is what you need to do on the LinkedIn. But it has been seen that people are making blunder mistake on their profiles. LinkedIn being a source of connecting recruiters with the employees and professionals from all around the world. It takes a professional stage of connecting them on dynamic grounds. So while likeminded people meet, share their ideas among themselves it becomes important to keep a check on what we are presenting to them. So make sure what all you are doing on your profile. Now the very first mistake you might be doing on your profile is OVERSHARING. Oversharing on a social website is in all round harm to oneself. Every social site say, Facebook, Twitter, or LinkedIn, they all have their own perspective for the profile to be made and share. You need to check if a lot of personal stuff is getting over your LinkedIn profile. It’s important for you to make it look more professional. No recruiter is interested to know your hobbies or interest. They are there to know your work, your professional front. Don’t share negative comments about search or any company or recruiter over your profile. Make sure to be smart and concise while commenting. You would definitely not like to get into trouble of losing jobs. Don’t share up vague status on your profile that does not match with your work profile. This would leave a negative impact on the recruiters about you. This would also give the recruiter to take that point and use it against you in further meeting or at interview. So make sure you say what you mean so that you don’t get into any trouble. LinkedIn group forums are completely public. They have access to the higher ends. Anyone can read and comment in the forums. You can share your questions, give answers but make sure you do not share any confidential information about any company or you’re ex company in the forums. You must know that all the companies are inter-connected. Sharing this out would break recruiters trust in you. So it’s better that you take care before sharing. Disclosing your preferences on various issues like, Religion, culture, caste system, etc is counted negative in professional world. So make sure that you do not share your personal views on any social issues. Try to avoid references in your job search. Recruiters are first interested to know you than the references. So face them and answer them rather than a mediator to work for you. So avoid references of your past company or employers while the job search. Don’t share your twitter over your profile. Let it be as simple as possible. Sharing up all of your tweets on your profile is not a good idea. So let twitter and LinkedIn remain different and just share up your link to your profile for a way to know you more. Facebook is more of a site to meet your loved ones, share your personal stuff, your moods and your life. Definitely recruiters are not interested to know or see all that. So there is no need to share your facebook profile over LinkedIn so that people can see your professional aspect than the leisure one. Do not share your content again and again. If you have shared something for once or twice do not keep sharing it again and again just to make content in your profile. If you’re not getting any topic you can re write on any topic already discussed? People love to listen remix and new compositions of old. So write your views on any topic and share. Giving your views would help you build image but if you are over sharing the content them you are making a blunder mistake. It’s not a social site where you can share out your profile with anyone anywhere. It’s not Facebook to connect with people. This aims at making a contact with the people from your own field, or whom you know personally and the other employers or recruiters you work with. It’s a professional contact and needs to be like that. It would for sure make your profile get down in the eyes of the professionals and recruiters. Your profile is an advertisement of your brand. It needs to look like the way the audience can relate to. So make sure that your profile shows the best of you professionally. There is no use of the searching if you are not capable of showing what they want. If your profile does not meet there standards then your search will not provide you with fruitful results. So make sure that you provide with good profile to get successful results. Your over sharing of waste things could also spam you in the list of many recruiters. Sharing up personal stuff would make a bad image and spam you forever in the list. So it’s better to save yourself from getting out of the line. So, as you got to know why over sharing is harmful for you. Now you just need to go and check what all you were sharing on your profile and if the things are over shared and match the un-do list then it’s high time. Just take a step back and remove all the stuff as soon as possible to make sure that it doesn’t affect you anymore.